So you've handled a sailboat or cruiser, have you? That's very different from handling a houseboat, which averages 35 feet in length, goes between 15 and 20 miles an hour, and weighs about five tons. Have "no brakes" means that if you goof, you may be the cause of a hull-banging and paint-scraping experience, not to mention what can happen to what you've hit. Remember, reversing your engine is the only braking mechanism that you have for your houseboat. Docking can be a real thrill, especially if you forget about not having brakes. Ten thousand pounds of boat will not stop short when power is cut. It's best to approach the dock while heading upstream, or into the wind, since the houseboat is easier to control that way. Use only enough power to maintain steerageway (your minimum speed with control). Remember, speed times weight can equal a horrible crunch! At only two miles an hour, your houseboat can damage a dock as well as itself. Approach the dock at no more than one mile per hour. Practice working with minimum speed needed to maintain response before your first docking. Unlike a smaller motorboat, a house boat needs plenty of room and time to maneuver. In fact, handling a houseboat requires practice: going through tight spots like locks or into slips requires skill, quick action, and physical strength-for fending off-on the part of at least two crew members. The average houseboat operator is not a professional pilot, and great care is needed to be able to master the vessel in all situations. Remember, when you turn the wheel of a houseboat, the stern (or back part of the boat) is the first to react. Thus, if the wheel is turned to the right, the stern swings to the left. This may seem weird at first, because an automobile responds in just the opposite manner. Before getting underway, review operating and safety procedures with all passengers. Locate safety equipment. Have a backup who can operate the boat if you become ill or injured. Read and understand government regulations governing the waterway on which you will be traveling. Know the marking systems and the signaling rules. Here are some general basic rules: 1. Approaching an oncoming boat, keep to the right. 2. Know proper maneuvering signals and use them. The trickiest operation on a houseboat, strangely enough, is refueling. Smoking, naturally, is taboo during refueling and all electrical appliances and lights should be turned off. Pilot lights on any appliances should also be turned off. If the boat has built-in fuel tanks, keep all doors and windows closed to prevent heavier-than-air gasoline vapors from seeping inside cabins and the engine compartment. Fill all portable tanks on the deck. Ventilate before starting the engine. The blower should always be run for a few minutes and until all gas odors have left the engine compartment. A houseboat without a first aid kit aboard shows very poor planning. Keep a well-stocked first aid kit handy, and remember to replenish supplies as they are used. At least one crew member should know first aid. First aid training should be an essential part of training for all houseboaters. Be sure you have the proper size fire extinguishers (minimum size, five pounds) and know how to use them. Fire extinguishers, by the way, are required by law to be on board. With an engine compartment fire, the chance of explosion is present. If a fire breaks out in the engine compartment, turn the engine off at once. Fire in the galley is dangerous but preventable. Most galley fires are caused when a landlubber cook puts too much food in a pan and doesn't take into account the pitching and rolling of the boat. Use as little fat as possible, and be sure that curtains near the stove are tied away from the flame. Life jackets and life preservers: Be sure you have the right size life jacket for each person on board. Fit your life jacket snugly and know how to adjust it. Remember, too, that because there may not be time to put on your life jacket while you are still on the houseboat, you and your crew will have to learn how to put it on in the water. That takes a bit of practice. If you and your crew are not good swimmers, think about wearing life jackets while underway. Keep the victim in sight at all times. Throw a floatable item (PFD, large plastic bottle, thermos jug, ring buoy, etc.) to the person overboard and bring the boat around. Never reverse, as the propeller may strike the victim. Approach the person slowly and carefully in a manner that keeps them upwind of your boat. Whenever possible, cut the engine until the person is back aboard. Arrange to take your houseboat out for a half-day or full-day cruise before taking your vacation. This additional "hands on" experience will better prepare you for your cruise. If you will be using patrolled waterways, register your itinerary with friends or your marina, leaving emergency telephone numbers and any other important information. Also, file a float plan (outlining where you'll be on different dates) with someone. Don't hesitate to ask for help if you need it. Your houseboat is your key to America's waterways, which are enjoyable, relaxing, and very beautiful. Leave them as you found them, free from clutter and litter. Have a safe and pleasant trip. 1. No waterskiing. Although some houseboats are powerful and fast enough to pull skiers, doing so is dangerous because a houseboat is not maneuverable enough. It is also a time-consuming nuisance to come about and retrieve a spilled skier. In addition, the large wake produced is not only discourteous to other craft but can be dangerous. 2. No Tinkering. Don't tinker with the fuel system or the electrical and control systems. If something goes amiss, ask a qualified technician to help. 3. No Operating Under The Influence. Don't even think about drinking alcohol and operating your houseboat. As skipper, you have to keep your wits about you at all times while you're underway and even one drink (combined with sun, waves, and other elements associated with boating) can impair your senses. Your passengers and your vessel are your responsibility and alcohol and drugs have been proven to be the cause of most boating accidents. 4. No Swimming Near Your Propellers. Never forget the danger to swimmers which boat propellers can inflict. 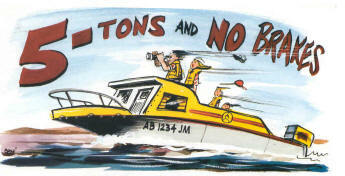 Shut off your engines when approaching swimmers and keep swimmers away from your stern. 5. No Wake. Watch your wake because you may upset small boats and damage others at docks, even a great distance away. Remember, you are legally responsible for any damage caused by the wake of your craft. An alarming number of carbon monoxide deaths involving houseboats have occurred because gasoline-powered generators with through-transom exhaust systems were running and exhaust fumes became trapped beneath the swim platform while swimmers were in the water. Turn off both your engine and your generator when people are swimming near your houseboat. Although it is perhaps a bit embarrassing, at times it may happen that you have to be towed. If you are being towed, remember that the towline is under great stress, and if it breaks it can whip and cause serious injuries. Be sure that all crew members stay away from the line while your houseboat is being towed. Many people will not tow you unless you provide the line. Be sure to have a stout towline aboard for such emergencies. A new houseboater should tie up for the night at a marina or (with permission) at a private pier. A novice might not know whether a cover or quiet inlet will be safe. The boat can be left high and dry if the water recedes out of that lovely inlet during the night because of the tides. Locks and dams on rivers can also become a roaring torrent after a hard rain upstream. If at dusk you can't reach a dock, anchor out of the main channel or tie up to trees near the bank. When about 75 feet from your anchorage, drop the stern anchor from the rear deck. Be careful not to foul your propeller. When the stern anchor is secure, move in closer and tie the bow line to some fixed object on the shore, or secure the boat anchor into the shoreline. Remember, two anchors are required to moor your houseboat adequately. Be sure the anchors you have are of sufficient weight.